The revolution initiated a return to the classics and the Greek Cameo. This was probably stimulated by Napoleon himself who had on his foreign travels collected an impressive collection of these. 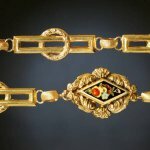 Another trend inspired by the Napoleon wars was the creation of a certain type of jewel. The so-called 'Fer de Berlin' or 'Berlin iron'. Through the Greeks the Roman influence came to be felt as a matter of course. This manifested itself in jewellery in the form of mosaics. Mosaics can be divided into two distinct groups. The Pietra Dura and the Glass mosaics. Pietra Dura is a technique whereby flakes or chips of colored marble are pressed into a combination in hot wax. The Glass Mosaic was made by pressing pieces of glass, sometimes prejoined to form a picture, into the wax. These are fairly easy to date accurately. The fashion for these items started around 1830 and lasted up to around 1880. The earlier ones were for the most part made of monochrome (single colour) glass toward the 1880 however we find instances of glass being used in multi-layers. The artisan would no longer need to set pieces of glass together to create a pillar rather he could buy a complete pillar, shadow and all, and place it in his picture.To make life even easier, even a river, for instance, no longer needed to be made of more pieces of glass, for the artist could buy.